An opened worldmap of Britannia, created with the cartography skill. Cartography allows the creation of maps and the decoding of treasure maps. Common maps can be used for orientational purposes and furthermore for plotting courses for a boat. 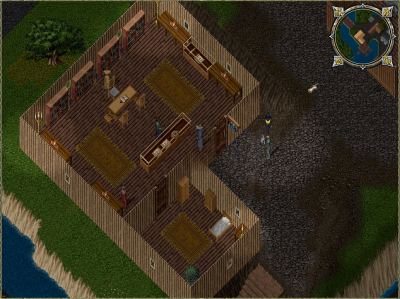 Treasure maps lead to treasures holding less or more valuables, depending on the level of the treasure map. 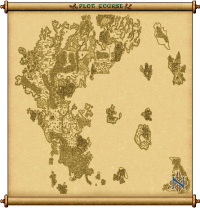 As for using the maps for just navigation in the world, the UO Auto Map program is a much better alternative. 3.2 Where Can I Find a Treasure Map? Cartography was recently changed. You can now GM Cartography from 30-GM making any type of map from start to finish. The Oaken Oar, map maker shop in Britain. Britain The Oaken Oar 10º53'S 7º1'E"
Remove Trap (to safely remove the trap you found). (optional) The spell "Telekinesis" may suffice for 1st-level chests. Strong characters may try to just open the chest and take the damage. Lockpicking, and a bag full of lock picks (to open the chest). The spell "Magic Unlock" may suffice to open first and second level chests, a minimum magery skill of 50 is required to have the chest unlock to that spell. Combat skills, to defeat the treasure's guardians. Where Can I Find a Treasure Map? What monsters carry treasure maps ? 1 - Earth Elementals, Ettins, Evil Mage, Gargoyles, Gazers, Liches, Ogres, Ophidian Enforcers, Ophidian Warriors, Orcs, Orc Lords, Orc Mages, Terathan Warriors, and Trolls. 2 - Air Elementals, Fire Elementals, Frost Trolls, Mummy, Ophidian Apprentice Mages, Ophidian Justicar, Ophidian Shaman, (Ophidian Zealots), Reapers, Sea Serpents, Snow Elementals, Stone Gargoyles, Water Elementals and Wyverns. 3 - Cyclopean Warriors, (Evil Mage Lords), Drakes, Dread Spiders, Efreets, Frost Trolls, Liches, Ogre Lords, Ophidian Avengers, Ophidian Knight-Errants, Snow Elementals and Terathan Avengers. 4 - Daemons, Deep Sea Serpents, Dragons, Elder Gazers, Ice Fiends, Lich Lords, Terathan Matriarchs, Titans and White Wyrms. 5 - Ancient Wyrms, Balrons, Blood Elementals, Ophidian Matriarchs, Poison Elementals and Titans. Monsters in ( ) need to be confirmed, if you claim any maps from these monsters please delete ( ) and/or adjust it to correct level. Level One and two maps are vastly different than the other three classes of maps, in that they can be easily tackled alone. Level Three maps and above are really more of a "group activity*", (* Purely opinion of the original author, a bard can easily tackle any map level). Because of this difficulty curve, you may find higher-level maps for sale from other players and their vendors. Be very wary when purchasing these maps -- maps that have been decoded or dug up already are labeled differently than virgin maps. If you are thinking of purchasing one, the map must read "a tattered treasure map" when you single-click on it. If it does not, then do not attempt to purchase it. It will be useless to you. I have a map -- now what do I do with it? Once you find a map, simply double click it to decode it. Your ability to decode the map is based on your cartography skill -- the higher your skill, the more more likely you are to be able to decode any and all treasure maps. (If you are unable to decode a map, you may pass it along or sell it to someone who can). These maps may be stored safely in your bank, until you decide to hunt after it; for the treasure will not begin to "decay away" until you actually dig up the chest (after which time the chest and its contents will linger for about no more than 3-4 hours. You may also smash the chest with an axe when finished, this removes the chest instantly and is help full for other treasure hunters). These are minimum requirements. The higher your cartography skill, the more detail the map will show. The pin will always be on the exact location of the treasure. After decoding your treasure map, the center will be indicated with a single pin. Once decoded, this map cannot be passed off to another player -- the first person to decode the map must also be the one who digs up the treasure. To determine if you are close to where you need to be you can make a detailed map of the area where you are by using the cartography skill. Comparing the drawn map with the treasure map can give valuable clues, the center of the drawn map will be your exact current location. You can even use the aid of an external drawing program to compare the two maps and determine in which direction you should search. Some people simply use a transparent piece of paper with an X drawn on it to determine the center of the drawn map. Many of the treasure chests are located on islands, requiring either a ship or access to a very good rune library. The inexperienced, and those not intimately familiar with the lands of Britannia would be well-advised to stick to sea-travel. For it is easier by far to find your quarry by ship, then it is to island-hop via rune hoping to find the right spot. If you fail to find the treasure, move on a bit and try again -- the treasure may be as far as three screens away from the perceived "center of the map". The treasure will be buried at the spot where the red pin actually pierces the map. After some attempts you will at one time hear the distinct sound of digging, the same sound miners hear when they mine for ore. This means you have found the treasure chest. At first you will see the ground where you are digging change into "a dirt patch" and soon thereafter the chest will pop-up. The first round of monsters may spawn and you will have to get rid of them. After that the fun of opening the chest can begin. "You dig and dig, but do not find any treasure". Meaning the treasure is not there. "You dig and dig, but no treasure seems to be here". Meaning you are close to the treasure, but not close enough to dig it up. "You stop digging because something is directly on top of the treasure chest". Have the person, animal or monster move away from that spot and dig again. There seems to be no message for success, but you will hear the sound and then see the dirt patch and the treasure chest appear. Another treasure-hunting suggestion is to bring along several blank maps, and use your cartography skill to create a map of the area -- comparing this terrain map against the treasure map can be quite helpful. As valuable as the map might seem to the intrepid treasure hunter, once you successfully find and dig up the treasure your map becomes useless. While searching, your mining skill will come in handy. The higher your Mining skill, the larger your dig radius. Regardless of where you click on the floor, you will always dig at the location where you are standing. If you want to skip the running around and digging everywhere looking for the correct spot bit, then I suggest you have a look in the Treasure Map Sextant Coordinates section. The exact sextant location of at least 200 known treasure map locations can be found in there. I've found the chest -- now I'm rich beyond my wildest dreams, right!? Well, not exactly. Most chests are trapped and do damage equal to chests fitted with a Tinker's trap. Of more concern are the monsters which spawn nearby when the chests are dug up, and spawn when you remove items from the chest. These creatures can be very dangerous, and seem inclined to target the chest-digger as soon as they appear. Note: The chests have been said to disappear within 1-3 hours after being unearthed, whether they have been cracked open or not. Use "Detect Hidden" to check for traps. If you do not do this you may be able to pick the lock, but you will need a higher Lockpicking skill. Of course for GM Lockpickers this is not a problem at all. Use "Remove Trap" to remove the trap or just skip this and deal with the effect of the trap later. Use lock picks to pick the lock of the chest. Alternatively you can use the "Magic Unlock" spell for lower level maps. Open the container by double-clicking on it. If you did not remove the trap then it is advisable to use the "Telekinesis" spell from a safe distance to avoid the damage. Alternatively, strong characters may try to just take the damage, but chances are the effects of the trap will kill you. Note: The player that decodes the map and digs up the chest does not have to be the same player that picks open the chest. Alternatively telekinesis spell can be uses to trigger any trap from a safe distance. Chests can also be smashed with an axe after being emptied(Items inside chest will disappear with it), please try and do this as common courtesy for other treasure hunters. * Detect is automatically factored in when picking locks, and there is no need to actively use the skill on the chest. *** 95.0 Real LP and 60.0 DH will allow you to attempt to unlock a level 5 map but will take several attempts. - Daedalus Rising of Atlantic, Kynaerth'an of Catskills. Many thanks go out to Khadgar, who was of great assistance in getting me up to speed on the treasure chest quests -- and to the many who helped provide me with the hard data. This page was last modified on 12 April 2019, at 03:37.